Now don't you go handing one to me with that pleading look on your face! On second thought, if you handed it to me in person (which of course would be the only way you could hand it to me), I just might bake you some cookies! C'mon over! You don't know what "in person" means??? Ooooo, you are SO mean! Hooray! 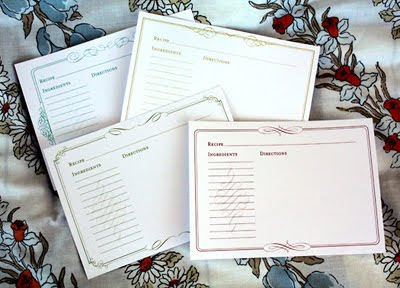 I was just looking for some cute printable recipe cards the other day, and these are perfect! Thanks! Followed the link from How About Orange. Fun! I just cannot tell you how much I enjoy this blog! I'm always so excited when my Google Reader shows (1) by your name - everything that's posted is so helpful and fun! thanks so much for that link! they are wonderful! Love them. Especially the aqua :) thanks!!! Really it is a great site which offer free printable recipe cards products. I had searching this type of various fancy flourishes recipe cards. Thanks for informing.